Preparing for take-off this summer should mean much more than fastening your seat belt and ensuring your bag is safely stowed in the overhead lockers. It’s no secret that flying takes the goodness out of your skin so what about your inflight skincare routine? Whilst we all want to come back from holiday with that enviable summer glow, our hopes can be dashed even from the point of hitting the runway. Spending just a few hours exposed to the dry and aggressively conditioned cabin air can leave it seriously dehydrated, dull and puffy. Not a good look for those holiday instagrams. Follow our skin-saving tips to protect your skin whilst airborne and leave it looking flawless and radiant upon touch-down... (Plus, it’s a glorious way to pass the time at 32,000 ft). Your skin barely has a chance to breathe whilst in the poorly conditioned cabin so give it all the air it can get by removing your makeup as soon as you sit down. This will be the best way to ensure your pores don’t become congested, limiting any chance of breakouts. Micellar Cleansing Water - such as our formulas with Rose Petals - is an idea in-flight cleanser. It easily removes makeup with a simple cotton pad and doesn’t leave any residue that needs to be washed off. The water-based formula is also super refreshing which will help the skin to feel comfortable. It is also handily included in our Deluxe 6 minis travel kit, so you can take the perfect size with you on-board. The skin’s pH can become severely imbalanced whilst in the air, but using a toner after makeup removal will help to prevent it from becoming too oily or dry. It’s the best in-flight refresher for the skin too, so keep topped up by regularly sweeping a toner-soaked cotton pad over the face to remove any accumulated grease and grime. Psst! Did you know that we offer a mini Gentle Toning Lotion with rose petals on every order placed on Nuxe website*? Every minute spent in the air means more moisture is being zapped right out of the skin so it’s important to keep the complexion thoroughly nourished. The most effective way to intensely hydrate is by using a rich, moisturising face mask. Our Moisturising Mask Crème Fraîche® de Beauté uses plant milks and hyaluronic acid to provide 48-hour hydration and protect your skin from pollution. Apply a thick veil of product over the face and allow it to soak in over a couple of hours to leave the skin seriously soft and features relaxed. Our Moisturising mask comes into a handy format, perfect for your in-flight routine! In need of a moisturising cream too? Our Moisturising cream Crème Fraîche ® de Beauté is available in 15ml bottle in our Prodigieux Travel Pouch. The skin around our eyes is the most fragile and doesn’t tend to create its own moisture, so our eyes can become the first to show the signs of in-flight stress. To prevent the appearance of any puffiness and dark circles, apply a thick layer of a cooling eye cream, such as our Nuxellence® Eye Contour underneath the eyes and across the brow bone. The massage applicator really helps to decongest and smooth the eye-area and the formula will leave the skin hydrated and brightened. What’s more, it also available in our travel kit in 15ml size, perfect for any flight. Lips are another body part that don’t cope well under cabin conditions, often becoming very dry, sore and cracked. Score an easy win and layer up with a nourishing lip product such as our Reve de Miel® lip balm before, during and post flight. As you start making your descent, it’s time to start prepping the skin for arrival. Go in with one last swipe of toning lotion or cleanser. If you’re stepping straight out into the sun, be sure to use a facial SPF such adapted to your needs so you’re instantly protected from the sun’s dangerous rays. 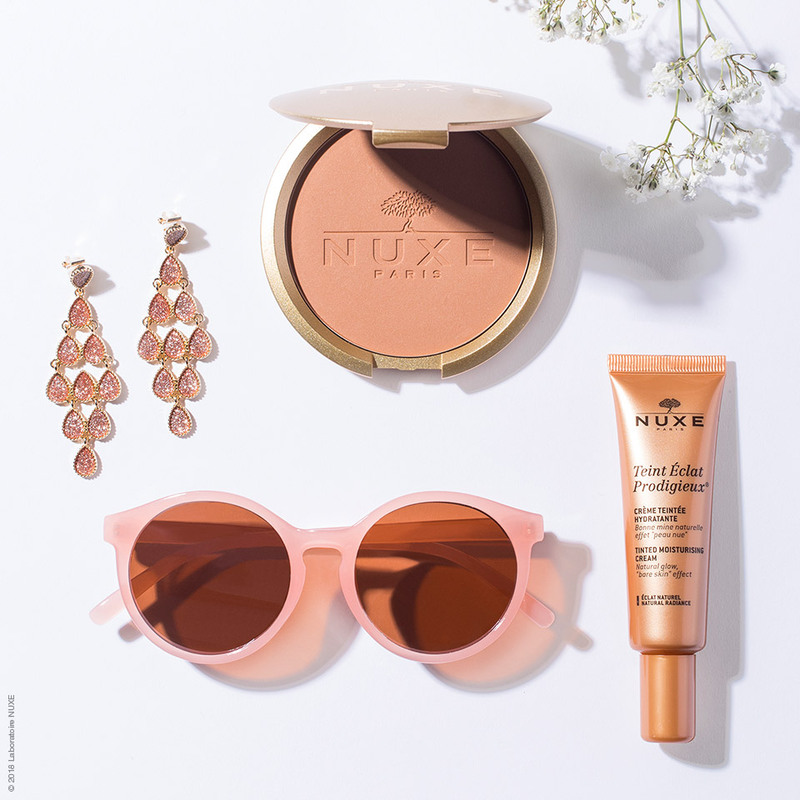 To also ensure you’re looking radiant as you exit the plane and to start your holiday in style, don’t forget to apply some of our Huile Prodigieuse® shimmering oil and discover our make-up range! Check out all our travel essentials which make the perfect on-the-go holiday companions!